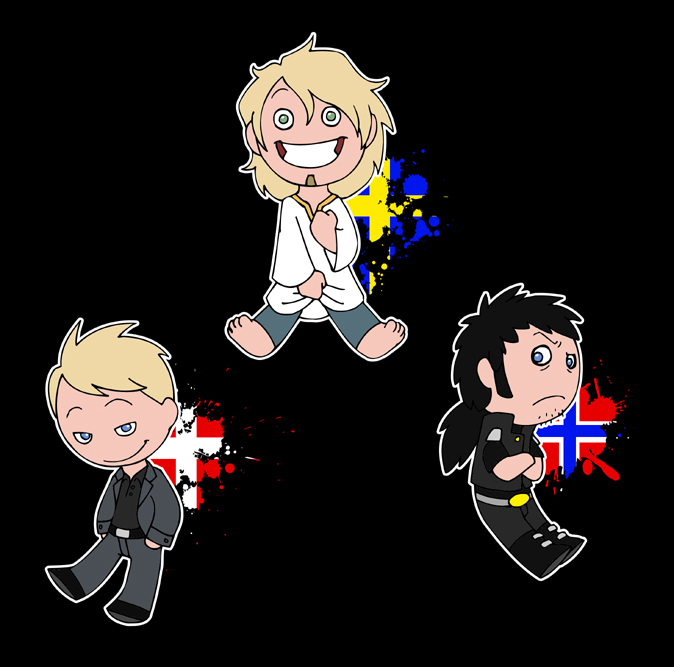 A week ago I realized that I have three Scandinavian guys as baddies, so I thought it would be fun to line them up like this. It felt amazingly good after having drawn the extremely stereotypical (and mainly nice) Scandinavians from SatW for so long. Peter is supposed to be Niels’ symbolic older brother, and to emphasize that, I not only gave him the same skin and hair colour as Niels, but I also gave him a Swedish last name, Eriksson, hinting that his ancestors came from Sweden. Axel is from a completely different comic I planned on turning into a web-comic three years ago, but then a lot of stuff happened, and I forgot about it. Now my Niels comic has pretty much turned into what Axel’s comic was about: A villain who has to deal with family, employees and good guys. Axel was basically a Norwegian emo/goth boy with rock star dreams. He wanted to play music, but his father expected him to take over his villain business. So Axel was less than enthusiastic about his job, which meant non of the good guys were recurring characters, because he simply killed them as soon as they showed up. He just wanted to get the job over with, and had no time to play cat and mouse with them. Because the comic will never be made, I can reveal that he didn’t get a happy ending, and ended up giving up on his music dreams and shaved his long hair off. Anyway, I’ve been wanting to give him cameo appearances in the Niels comics for a long time, so he’ll probably show up one day.